For the month of May I was asked to participate in an Instagram giveaway, with nine other IG party ladies, for #StylewithTarget. I jumped at the chance, you know me, any excuse to plan a party! Each hostess picked a theme to style a party table, bar cart, tray...you name it. I thought this was such a fabulous idea, you can find so many great things at Target to plan a pretty and stylish party, while still being affordable. You will find most of the items used to style this party, as well as the other parties done by my co-hosts of the giveaway, at your local Target. I chose to feature a Mother's Day Brunch, however you could easily replicate this party to celebrate for any girly event or ladies lunch. I have personally celebrated my mom for many years by hosting either a brunch or tea and we have always had a lot of fun. I also love the chance when I can be extra girly, and mother's day is the perfect opportunity! I decorated the bar cart with a floral banner and a couple of printables that I found online, some of them were even free! I printed and framed them using frames I had lying around and they turned out great, adding a simple feminine touch. I served a couple different varieties of white wine by Sutter Home, keeping it light and fresh on a beautiful afternoon. You can find Sutter Home at your local Target. The smaller bottles come in a four pack and are perfect for a single serving or to take home as a party favor. The 'MOM' banner can be found at Hostess with the Mostest Blog. I loved how this cart turned out; simple, classy and pretty! Watercolor 'Happy Mother's Day' card is available to purchase on Etsy. This print is gorgeous and ties perfectly with the gold frame. 8x10 Motherhood printable can be found at 'Yesterday on Tuesday' and the 4x6 print can be found at Sweet Charli. I think the colors of these printables tied in perfectly with the theme. For the table I chose to go with a color scheme of pink & goldish/yellow. For ambiance I added outdoor lanterns with candles. For the place setting I used yellow craft paper as placemats, added a beautiful pink runner to the center of the table (the runner is actually a scarf that was laid out) and paper-ware. I found the adorable selection of Cheeky paper products at Target and chose their plates with pink dots, and for the layered affect I also added white paper plates. Then topped with striped napkins tied with a pretty pink bow, and set out gold glitter utensils to add a little sparkle. I love using fresh flowers to brighten up a table; a mix of white and pink flowers set in a beautiful milk glass vase was the perfect centerpiece. Each guest received a little gift at their seat, a 'pink lemonade' candle tied with pink ribbon. Most of the items used can be found at your local Target (a complete list is detailed at the end of this post), making this party, affordable and beautiful. Mom's do so much and this is the least I could do to show how much I appreciate all that my mom does for me and my kiddos. Thank you for everything mom! I loved getting the chance to create an affordable event based on items found at one of my favorite stores, Target! 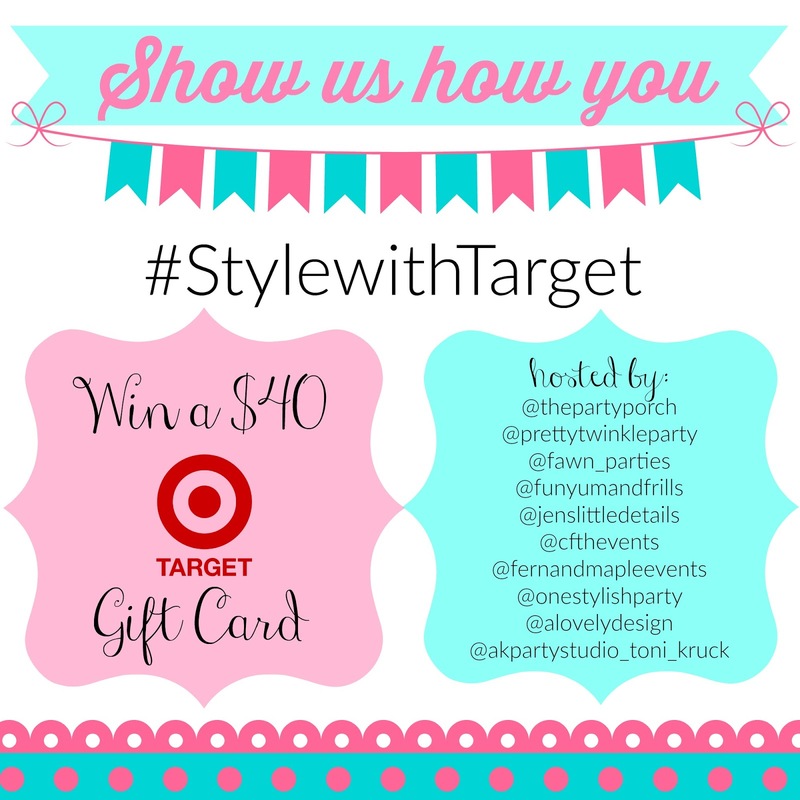 I collaborated with nine other amazing party ladies for this giveaway, they share my love of party styling and shopping at Target! 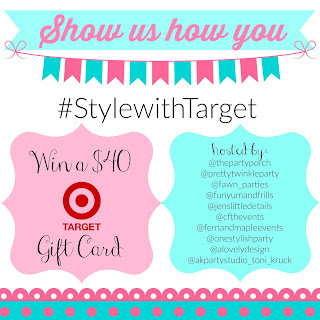 We created a fun hashtag #stylewithtarget, each week for five weeks we will be giving away $40 to Target! So head on over to my Instagram @akpartystudio_toni_kruck to see all the details! Gorgeous as always and I am lucky to be your mom! So beautiful! Love all the little details. OMG!! This mother’s day brunch is awesome. Simply in love with all your arrangements. The party favors are best and now I want to arrange a surprise mother’s day luncheon for my mom at one of corporate events NYC. Will make amazing arrangements for the day. Thank you! Sounds like a great idea! !